Our celebration candle is the ultimate indulgence for special occassions. The ultimate luxury gift that says you are special. It's also perfect for those celebration times such as engagements, weddings, birthdays, and baby showers. It throws a complex aroma that heightens your senses. Delightful fruity notes of pomegrnate with the intoxicating allure of champagne. 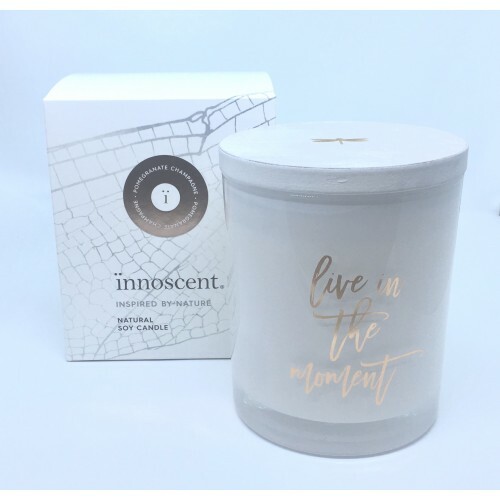 The celebration is the height of sophistication in a white glass container with rose gold accents and the motif live in the moment on the glass. It has a premium oak timber lid etched with our symbolic dragonfly. It's our largest candle in our collection to make sure that celebration lasts and lasts. Approx 80 hours burn time.